Basements are usually the most neglected part of the home. It is easy to forget about that part of the house because it is primarily used for storage for some people. If neglected for too long, the basement could turn your house into a money pit. As much as the basement is used for storage, you can also turn it into the second living room. You can also turn it into an extra bedroom if you have a growing family. There could be a couple of reasons that might stop you from being creative with the basement space. You may notice some obvious signs of basement remodeling after a thorough inspection. Doing it on your own could be challenging if you don’t have any masonry skills. You can always reach out to Gehman Remodeling if you’re looking for a complete remodeling. It is time for remodeling if there several structural damages in the basement. It could be the ceiling, pillars, flooring, and the walls that have been damaged. If left unattended, the walls could start bending which can be dangerous for the whole house. You might also notice several cracks that have developed on the floor of the basement. The damages not only make the basement ugly but unbearable to live in. Water spots: This could be a clear indication there is leakage in the basement. It is a sign that something needs to be fixed immediately and it would be disastrous to wait. The problem may also be caused by grading which often results in water coming into the basement. Water spots can cause long-term damage to the property if it is not properly addressed. Cracked floors and Walls: Cracks, if left unrepaired, will definitely get worse over time. Cracks on the floor cause hydrostatic pressure because water goes through the spaces. Larger cracks could mean there is a problem with the foundation. Chalky Walls: This is referred to as efflorescence. It is usually caused by minerals deposits which come about as a result of water seepage that goes through openings caused by cracks. Bowed Walls: You will notice a bulge on the walls and usually curves inwards. Such bowed bulges can comprise the overall foundation structure of the basement structure. This is a problem that should be addressed as soon as it is sighted because it could lead to more serious problems. Musty and Damp Smell: It is very hard to ignore it if your basement has a musty smell. It has nothing to do with the general cleaning of the basement. It is a clear sign that there is water has entered the walls or the floors. It could also mean that there is mold. Mildew Present: You know you’ve completely neglected the basement when you notice there is mildew present. You should call for an expert if you ever find yourself in such in a situation because the problem can be deeper and the source will need to be identified. There is a chance that harmful chemicals were used if your house was built a long time ago. Use of older paints, volatile organic compounds, radon, asbestos, and solvents are not only harmful to humans but also the environment. If your house was constructed years ago, there is no harm in renovating to give it a new look too. There are plumbing problems that usually come from the basement. If there is a leak with the water pipes or sewer, everything spills to the basement. It is for this reason why some people avoid to go to the basement unless it is completely necessary. Even if you decide to clean, that might not be enough because the water could have damaged the walls and floor. Instead of calling a plumber and renovators separately, you can reach out to Gehman Remodeling to have an all-inclusive solution. This will save you on cost and you can be assured of getting quality results because you’re dealing with professionals. The elements could be staircase, poles, joists, and, doors. Due to wear and tear, these elements can develop spots, holes, cracks, and spots. This makes the basement look ugly and unlivable. The elements can become loose and start warping and splitting. This can be dangerous to the occupants of the house especially if the stairs are in bad shape. Keeping the remodeling on a budget can be challenging. If not properly checked, you’ll find that you’re going way over what you intended to spend. You might start with the idea of remodeling the basement for a gym but you end up creating a fancy man cave with unnecessary furniture and equipment. Before you can even start the project, you need to determine how much you can set aside without hurting your finances. If you intend to use a contractor, you can always ask for a quote before you commit financially. A basement project can quickly get out of hand because of excitement and working without a plan. There are three common elements that should inform the project scope and this time, budget, and the project itself. If you find yourself going outside the scope, chances are also high that you might not complete the project on time with the finances allocated. Your plans might be modest in the beginning but you can easily be carried away with the milestones you’re achieving. Have a plan in place and make sure you stick to it allowing only for flexibility if it helps with the scope. You have determined that your basement is in dire need for a makeover. You can’t just start with the renovations immediately without researching what is needed and what to do. The research process should begin with how you’re going to handle the repairs first before anything else. The work might be too much and you’ll need to call a contractor. The next step is gathering ideas on how you want the basement to look like. Do you want to turn it into a lounge area or a gaming room? There are home improvement magazines, websites, trade shows where you can get inspiration. After you have researched and visualized how you’d like the basement to look like, the next step is determining what you need to bring your vision into reality. Necessity should be one of the considerations when making this decision. For example, if you want a lounge area, how often would you be using it? It might make sense just to budget for a single couch if you are not going to use it often. Make open spaces your friend. You can never go wrong with open spaces when it comes to design. You can add walls to separate the gym from the office area but it might not be the best idea. There are costs like electrical, walls, doors, and studs which make the renovation very expensive. There is also the limitation of the basement because of the size of the room. Having open spaces not only gives you flexibility but you also get to save a lot because the costs partitioning can run into the thousands. Many homeowners like to go all out when it comes to flooring. You don’t have to go for the top of the line solutions when there are other alternatives that could do the same work and are way cheaper. One of the reasons why you should look for cheaper alternatives is because basements can be prone to leaking. This is an unavoidable situation and using expensive options could be costly in the long run. Another reason is there several good looking flooring options on the market that don’t break the bank. You don’t have to go for customized options. Keeping it standard will not only save you money but will also keep things simple. You can repurpose and reuse when necessary. Make sure you’re following the law. Most countries require that there is an exit if you intend to put a bedroom in the basement. A simple egress window usually suffices. Quality, innovative, affordable remodeling projects are the goals of many homeowners. Remodeling projects can help fix design flaws in important areas of the home and increase the homeowners enjoyment of it. It can also dramatically improve a home’s curb appeal as well as the value of the property. The key is to find a home remodeling company you can trust to do the job right. For a growing number of people, that company is Gehman Design Remodeling. And there are a number of very good reasons Gehman is the company you should trust to handle your next home remodeling project. One of the reasons Gehman has earned the trust of the people in the communities it serves is because it’s a licensed, bonded and insured company. That means should any errors or accidents occur, the homeowner is not liable for covering the cost of handling the problem. Plus, Gehman is a member in good standing in a number of local, regional and national professional trade associations. Earning these designations from objective, third-party, organizations requires obtaining and maintaining a consistently high standard of work and successfully completing rigorous testing. Gehman has long done so with flying colors. The staff at Gehman is second to none. It is made up of well-trained professionals with expertise in a wide variety of areas. They have the skills and background to do an excellent job on any type of home remodeling project you have. From the moment you call Gehman, you will be impressed by their polite, friendly, knowledgeable staff. They will answer any questions you have, provide you with accurate, timely information, get to your home promptly at the agreed upon time and deliver the great results you want. The talented, innovative Gehman team uses only quality materials to turn your home remodeling dream into a reality. Gehman is a long-established company that has been providing high quality home remodeling services for homes throughout Pennsylvania for almost 30 years. Since the company’s founding in 1990, they have been a reliable source of quality workmanship. Homeowners throughout Pennsylvania have relied on Gehman to handle their home remodeling projects for decades. People know they have long been able to count on the staff at Gehman to be there when they are needed and deliver the quality remodeling services people want. Gehman is a long-standing pillar of reliable service in Harleysville and other communities in Pennsylvania. The amazing team at Gehman constantly draws praise for its extensive knowledge and expertise when it comes to home remodeling. They can provide homeowners with the information they need about licensing and permits, what materials to use and advice on ways to make remodeling projects look and function the best. The knowledge of remodeling design, unique styling, the best material for any type of remodeling project and ways to improve fit and function the staff at Gehman can share makes them the logical choice when Pennsylvania homeowners want to ensure their home remodeling projects are done well. No matter what type of remodeling project you want done on your home, the experienced professionals at Gehman have probably done it numerous times before. That level of experience is invaluable when you want to ensure your home remodeling project will look and function the way you want. With their years of experience, the team at Gehman can give you valuable insight into what type of projects will work best on the type and configuration home you have. Plus, they know exactly what to do to make the remodeling project you choose work perfectly because they have done ones like it many times before. Clear and direct communication before, during and after the remodeling project is important to ensuring the job meets the goals and expectations of the homeowner. Customers rave about the clear lines of communications the staff at Gehman creates and maintains throughout the entire process. From the earliest planning stages until project is completed and the homeowner is enjoying the upgrades, the Gehman team is in constant contact with the homeowner to get a clear understanding of what they want done, how they plan to use it and the way they want it to look. This helps to ensure the job is done right and the customer is satisfied. While some remodeling companies only specialize in a few limited types of remodeling projects, the areas in which the Gehman staff specializes are virtually limitless. They do amazing kitchen renovations, bathroom additions and upgrades,as well as special remodeling projects. Their specialties include whole house remodeling, adding or transforming garages, sheds, barns, porches and patios. They design and build home theaters, create fantastic finished attics and customized basements. Their work with commercial kitchens, home offices, structural repairs and making homes safe for the elderly or people with special needs, is second to none. Plus, they do millwork, cabinetry, flooring, countertops, HVAC, plumbing, painting and insulation. When you’re looking for a company in Pennsylvania with a reputation for doing excellent home remodeling and additions, Gehman is at the top of the list. They have a sterling reputation when it comes basic home remodeling projects and innovative, cutting-edge designs, build-outs and upgrades. Their body of work is breathtaking. Whether its simply upgrading the doors and windows or making major changes and additions, Gehman Design Remodeling is known for impressive workmanship, innovative style, eye-catching work and consistently completing the project on time and under budget. Upgrading your home doesn’t have to cost a fortune. Not when you hire the team at Gehman to handle the job. They can enhance your home’s curb appeal, make it function better for your family and transform the way it looks and feels for a lot less than you might imagine. They believe price shouldn’t be an obstacle to getting the home remodeling projects you need done. At Gehman they will show you how easy it is to afford to remodel all or part of your home and have it looking better than ever. At Gehman they believe the job isn’t complete until the customer is satisfied. From the moment you call them to when the job is finished, they do their best to satisfy you every step of the way. They take the time to answer all your question, give you an accurate cost and time estimate for completing the job, make sure they have a clear understanding of what you want done and give you regular updates on the project. Plus, they stand behind all their work and guarantee its quality. As a result, customers love their work and are quick to call if they need something else done. Most of the work the Gehman team does comes as the result of referrals. For them, word of mouth definitely is the best form of advertising. They customers are so pleased with their work, they act as an unpaid marketing team. They tell relatives, friends and neighbors about the upgrades made to their home and recommend they contact Gehman. This proves that Gehman’s commitment to doing top quality work on every single job is something customers appreciate. Customers are quick to tell others what a wonderful experience it was having Gehman handle their home remodeling project. This has led to a steady flow of referrals for more work. Take a few minutes to look through the portfolio of the home remodeling projects the Gehman team has done and you’re bound to be impressed. Over the past 30 years, they have done some amazing work on houses large and small and new and old. They will be glad to show you a gallery of their work or connect you to some former customers. Many people are inspired to make upgrades to their homes after seeing how the Gehman staff was able to transform the homes of others with just a few simple, affordable, stylish, functional, upgrades. These a just a few reason people have trusted Gehman Design Remodeling to handle their remodeling projects. Living Coral has been announced as the 2019 Color of the Year by the Pantone Color Institute. Living Coral is an eye-popping orange-pink hybrid. My initial reaction to Living Coral was that I while I like this color, I’m not sure that I want it in my home or wardrobe. So I decided to find creative uses of the bold color that work for myself and to share them with you. I don’t see Living Coral as a particularly soft color, even though Pantone describes Living Coral as “an affable and animating shade whose golden undertone gives it a softe r edge.” I prefer it as an accent color rather than something prominent when decorating a client’s home. But if you’re excited about the color, here are some places to use this trendy color in your home and yard. 1. Textiles are an easy way to play with bright colors in a room. Use accent pillows and throws to start small and simple. Small pieces offer a way to create a splash of color that is inviting. They are great to enjoy for a while and easy to swap out if you get tired of the color. 2. Decorative accents. Think about sprinkling Living Coral in a few small areas throughout a room via artwork, side tables, other small pieces of furniture floor or window treatments. A small amount of a big color disperses the color, drawing the eye around the room. 3. Furniture. 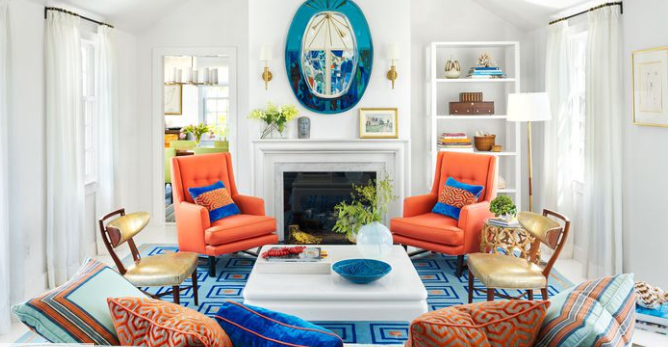 Consider coral-colored furniture to make a statement. Using your favorite color(s) is a better idea than choosing a color because it’s fashionable. But having your favorite color become trendy makes it easier to find items in that hue. So if you are a big fan of bright coral and want to decorate with it, 2019 will be your year to stock up on home furnishings. 4. Accent wall. One or two walls in Living Coral color is a bold way to bring it all in. In my opinion, I would think about keeping other things in the room light and neutral. Too much of Living Coral color in a room could start to feel a bit busy, maybe even induce anxiety. 5. Architectural accent. Because Living Coral is such a striking color, it can be called into service to bring attention to interesting architectural elements in your home. Go bold by using Living Coral on a beautiful built-in bookcase or in a traditional Foyer stairway to make it stand out. Too much of any bright color in a room causes everything to blend together, then nothing stands out. Use vivid hues only elements needing attention. 6. Outside. A great way to use vibrant color without it being in your face is with outside furniture and accessories. God uses Living Coral color in sunsets. Outdoor decorating in bold colors takes advantage of the abundant natural light during the day, and the forgiveness of darkness at night. As well, dark or cramped indoor spaces can feel claustrophobic when decorated with intense colors. 7. Doors. One of my favorite places to use a daring color is on doors. The Living Coral color on these doors inviting and energetic. To me, this is one of the best uses of bold colors — welcoming guests to your home. Tell us: What do you think of Pantone’s color choice? Have you used it in your home? Are you thinking about a remodeling project? Talk to the design build experts at Gehman Design Remodeling about the renovation of your dreams. Now is the perfect time to renovate! Check out other amazing projects here. “We Take Your Home Personally” making renovating your home easier than ever. Contact us today at 215-513-0300 to schedule an appointment in your Home to talk with us about the remodeling project you’re planning. Our talented team can help you design and build the new space you’ve been dreaming about. Every home investment is personal. It is a vision that you have that you would like to see it come to life. Home remodeling requires the very best to deliver. Despite this requirement, not everyone operates with a finite budget; we all want a good deal out there. Making the right choice is down to how organized you are when choosing. Prepare before you go on a search. These four questions can guide you further on what to choose. 1. What do others say about the contractor? Are there positive reviews of the contractor for you to peruse? Has anyone referred you to the contractor? You can trust the experience people have had with a remodeling contractor. Good contractors have an overwhelming body of positive reviews. There may be negative reviews here and there, but that should not deter you from choosing a contractor. If there is a negative review, you can use it during interviews. Ask the contractor what he or she did to help the client. Use your judgment to gauge his or her answer. If you have received a referral from someone, you can ask for more information about the contractor. If it is possible, visit the finished work. If there are before and after pictures or videos, you can request to see them. If you have received a recommendation from another technician, conduct your due diligence. Ask for more information. Did the technicians go to school together? Have they shared a job site before? What type of work relationship do they have? Awards go to the very best. Not everyone wins awards. Sometimes they say the second best always tries the hardest. Some contractors are not fortunate enough to win accolades, but they can deliver a project correctly. 2. Is the contractor certified? Do not hire a technician who does not have the necessary authorization to do a job. He or she may not know how to do the job. The chances are that he or she is a quack. The licenses must be up to date. With bonded remodeling contractors, check the status of the registrations. Some are under disciplinary review. If a contractor does not show all the legal documentation required to perform a remodeling job, just pass. Even if it is a referral, don’t be tempted to give the person the job. Remodeling contractors who trust their workmanship offer quality guarantees. In case anything goes wrong, they will come to fix it. Those who feel they may not do a great job hardly give work warranties. Look for the contractors who offer work guarantees. Someone ought to do the project right the first time. If someone does not want to come back to redo the job, they will insist on professional service. They will not cut corners. Workplace compensation insurance helps mitigate any accident that can occur while the technicians are within your premises. If the contractor does not have that, any form of liability falls on you. Most good contractors will take liability insurance for their projects. In case there is any error or costly omission, the insurance company will take care of it. If a contractor has a bad reputation, the insurance company will charge a hefty premium. If the insurance companies trust the contractor to be professional always, they will cover his workmanship failures. You can ask some of the tools that the contractor will use. Ask if the contractor has all of them. If there are tools that they don’t have, how do they plan to get them? Sometimes contractors lease tools for complex projects. Missing tools is not much of a red flag. 3. How is the portfolio? Take a great deal of time to look at the contractor’s portfolio. Inspect the projects that the contractor has done in the past. What is the completion rate? Did the customers give a good review? If there are customers who have left recommendation messages, that is a good sign. Some contractors buy good recommendations. If a contractor offers a lower bid in exchange for five stars, that is a red flag. What type of project do you want? An expert in the bathroom may not be comfortable helping you out with the kitchen. If someone has a niche area, he is better suited to handle the job. However, don’t rule out everyone else because of that. Medium to large contractors can do different types of projects perfectly, sometimes even concurrently. Be specific on the experience that you are looking for in a technician. Review several projects in that category. Organized experts such as Gehman Remodeling take pictures of before, during and after photos for every project they do. It is easy to follow through. A detailed overview of the finished project is imperative too. The only way to prove that someone is genuinely good is to look at the finished work. Is the overall workmanship great? How is the paintwork? How are the fittings? Is everything nice and tidy? Can you connect in person? How detailed is the quote or estimate? Are they responsive to questions? Reputable contractors may not pick calls during the day. They are mostly at the job site. The good ones will call you back. It takes time to finish your job. The contractor will be with you for several days. If it is an extensive renovation project, it might take a week or so. It is good to choose a likable person—someone you feel free to talk to when you have a problem. Some contractors are more organized than others are. The quality of the estimate will give you a clue about the remodeling company. A detailed quote can signify an organized person. Since the devil is always in the details, the more the details, the easier it is to know which bid handles the best work. Interview your potential contractors. While at it, be wary of those who dodge questions. Look for the contractor who offers straight answers without going around it. Prepare a list of questions. However, don’t make them too elaborate. Five issues are enough. The contractor doesn’t have all day to answer your questions. Keep the items simple. You can even email the questions in advance so that the contractor comes ready to connect with you. The best quote is the median. Some contractors quote low to lock in the job. Once they have started, they will bump up the costs upwards. Sometimes, you may pay more than you would have paid for had you chosen the most expensive contractor. A very high quote can signify that the contractor is highly specialized in the industry. However, that is not always the case. Instead of gambling, take the median bid. If you can answer each one of the questions in the affirmative, you are looking at an outstanding home remodeling contractor. You can go ahead with signing the contract. While at it, understand all the details. Read it through carefully. You can draw your contract terms if you are uncomfortable with what the contractor prepared. Be as detailed as possible. If you have a remodeling job that you want to be completed, you can contact Gehman Remodeling Contractors.